Is this the right book for me? Everything an amateur pigkeeper needs for success Get Started in Pig Keeping offers amateur pigkeepers everything they need to make a success of this increasingly popular pursuit. 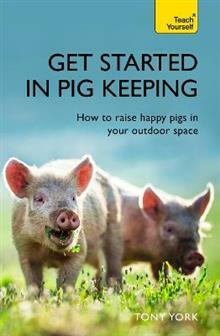 Whether you are interested in breeding pigs, in meat production, or just want the pleasure of their company, this book covers legalities, basic equipment, picking breeds, understanding behaviour and how to raise and slaughter pigs. You'll get all of the advice you need on daily maintenance of your animal, from feeding to cleaning, and find ample resources if you wish to produce your own meat - or even market and sell it at a local level. Get Started in Pig Keeping includes: Chapter 1: The starting point Chapter 2: Preparation and knowing the rules Chapter 3: Before your pig arrives Chapter 4: Can keeping pigs be cost effective? Chapter 5: Getting your first pig Chapter 6: Feeding your pig Chapter 7: The health of your pig Chapter 8: Breeding from your own stock Chapter 9: Meat for the freezer Chapter 10: Sales and Marketing Chapter 11: Who's who in the pig world Learn effortlessly with a new easy-to-read page design and interactive features: Not got much time? One, five and ten-minute introductions to key principles to get you started. Author insights Lots of instant help with common problems and quick tips for success, based on the author's many years of experience. Test yourself Tests in the book and online to keep track of your progress. Extend your knowledge Extra online articles to give you a richer understanding of the subject. Five things to remember Quick refreshers to help you remember the key facts. Try this Innovative exercises illustrate what you've learnt and how to use it. ABOUT THE SERIES People have been learning with Teach Yourself since 1938. With a vast range of practical how-to guides covering language learning, lifestyle, hobbies, business, psychology, and self-help, there's a Teach Yourself book for everything you want to do. Join more than 60 million people who have reached their goals with Teach Yourself, and never stop learning. Tony York has been running courses for amateur pig-keepers for over 10 years, and has seen the number of attendees triple in that time. He has made several television programmes on pigkeeping and is known in the community for his passionate commitment to furthering the cause of organic farming and smallholding as well as for his expert communication skills.